On 12 December 2018 the Vatican announced that Pell was one of three "more elderly" cardinals who were to leave the Pope's Council of Cardinal Advisers after a five year term. The three were also thanked by the Pope for their service. 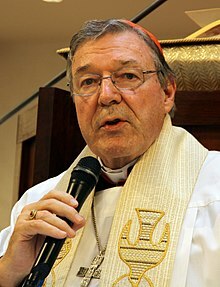 On 26 February 2019, the Vatican announced that Pell was no longer Prefect of the Secretariat for the Economy, stating that his five-year term had expired on 24 February. During a plea hearing on 27 February 2019, Pell's lawyer, Robert Richter, argued for a more lenient sentence for Pell and was required to accept the jury's verdict of guilty in order to do so. Richter argued that Pell's offence was "no more than a plain vanilla sexual penetration case". Richter later apologised for this remark. ^ a b Davey, Melissa (1 March 2019). "Cardinal George Pell's conviction: the questions that remain". The Guardian. Retrieved 18 March 2019. ^ a b "George Pell's lawyer Robert Richter apologises for 'plain vanilla' offending comments". ABC News. Australia. Retrieved 11 March 2019.